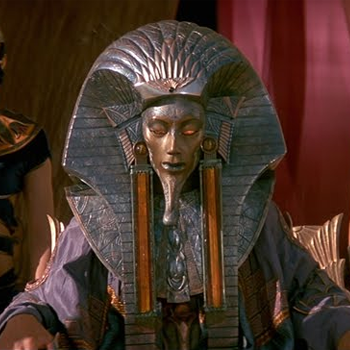 Almost two decades after having parted ways creatively, action director Roland Emmerich and writer/producer Dean Devlin will re-team to revive Stargate, a science-fiction franchise that helped launch them both to Hollywood fame in 1994. A surprise hit in its day, Stargate involved the discovery of an ancient Egyptian relic that opens a portal through time and space. This allowing a team of soldiers and scientists - James Spader and Kurt Russell - to travel to another galaxy where they encounter the alien beings that long ago presented themselves to humanity as the gods of Egypt. Emmerich is expected to return as director of the new film. The proposed new trilogy is being called a "reboot," but it is thus far unclear whether it will be an entirely new story based on the same premise or a continuation of the original film's story. It is not expected to tie-in with or make reference to the television series Stargate SG-1 or its myriad spin-offs, which Devlin and Emmerich have long been vocal about wanting no association with as they were produced without their input. The duo is also still prepping a sequel to their other 90s hit, Independence Day.